Why is it a holiday today? Last night, one of my younger colleagues asked us over dinner the reason why it was a holiday today. We all laughed at her naivete - it was common knowledge: today we remember the 26th death Anniversary of Sen. Benigno "Ninoy" Aquino. On a separate occasion, another friend asked if whether it was Ninoy's birthday or his death anniversary we are commemorating on Aug 21. While both mistakes can be attributable to memory gaps and are forgivable, it made me wonder about myself: Do I really understand why it was a holiday today? Or am I just happy that I don't have to work? If I, who was already alive at the time of Ninoy's assassination (albeit too young to remember) can so easily forget, how much more so for those who were born much later? Has Ninoy's symbol disappeared in the new generation? I credit the people behind the "I am Ninoy" campaign for helping to strengthen Ninoy's symbol, permeating media and culture fully as he did so in those years before his death. Kudos to you! I have read blogs lambasting this campaign as nothing more than money hungry institutions taking advantage of Ninoy's symbol. But to me and to the general public who do not have a personal relationship with this man, what is more relevant now are the ideals that Ninoy represented. In his death, Ninoy was immortalized through his legacy - his bravery to stand up against a dictator, his love and his faith for the Filipino People. And the "I am Ninoy" campaign has been instrumental in immortalizing Ninoy - through his spectacles - which has now become a symbol of patriotism for all Filipinos. Even as I say it is more important to strengthen Ninoy's symbol, I also want to remember that he was not just a symbol, but a real person. The best way to do that is through his family. Ninoy and Cory's daughter Kris Aquino, of course, is a constant figure in Philippine television. Ninoy and Cory's only son, Sen. Noynoy Aquino, a political figure in his own right. I would also like to mention Ninoy and Cory's eldest grandson, Jiggy Cruz, who has represented their family well during and after Pres. Cory Aquino's passing. He blogs at The Tangled Web. Let's not make his death meaningless..."
We look up to him as "the greatest leader we never had" but we cannot say for sure if he really would have been. 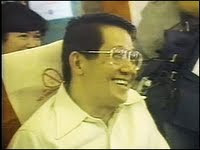 Right now, 26 years after his death, I think what's more important is to keep his symbol and his memory alive, to remember his sacrifice for the nation and for democracy, and to teach the young about how to be Ninoy.